Located in the heart of the Faubourg Saint Antoine, the historic district of the French cabinet, Loïc Kerisel workshop is part of the “court of Industry.” This place consists of three courses in a row, parts, old stables and barracks musketeers of King Louis XIV, are classified as historical monuments. The restoration of this place began in summer 2011 and be completed in late 2016. During this period, the City of Paris, the owner, has agreed to allow many craftsmen established to address this continue their activity. The goal is to keep that are artisans and make it a place of creativity as a place of memory of the great era of French furniture. 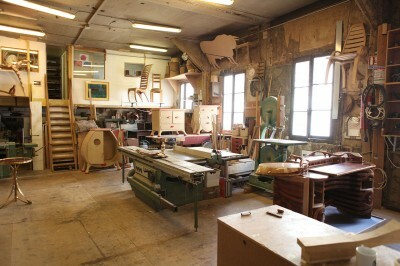 The woodworking shop art Loïc Kerisel home to many woodworking machines and is surrounded by those sculptors, gainiers, spin doctors, carpenters and upholsterers. The workshop is located 37 bis, rue de Montreuil, 75011 Paris.